The pro football regular season starts on Thursday. In the past couple of weeks alone, we've seen the National Football League's elite players sign contracts worth hundreds of millions of dollars. But it's not guaranteed that the players will actually receive all that money. Former Education Secretary Arne Duncan wrote about his experience working in education in a new book called "How Schools Work." Continuing the conversation Duncan had with Marketplace's Amy Scott, they discussed the seven years Duncan spent in Washington, and what has transpired since then in the education system. On Wednesday, Canadian and U.S. negotiators head back to the negotiating table for discussions on overhauling the North American Free Trade Agreement (NAFTA.) Over the weekend, President Trump tweeted that there was no need to keep Canada in the deal and he warned he might terminate it altogether. Then yesterday, Richard Trumka, the leader of the AFL-CIO labor union, told Fox News he didn't see how reform of NAFTA could work without Canada. And it's not just Americans who are divided over the pact. The U.S. and Canada also have some thorny issues to resolve. Trade talks with Canada resume Wednesday, and the stakes of a NAFTA agreement without Canada are high — trade between the two countries is worth $670 billion. But that's not in line with what the President tweeted over the weekend, which stoked a debate over Canada's inclusion in NAFTA. We're also looking ahead to this week's Senate Intelligence Committee hearing beginning Wednesday where social media executives will be in the hot seat talking about what they're doing to prevent meddling in U.S. elections. Labor Day weekend marks the final sprint for political campaigning and fundraising before the midterm elections in November. While Democrats and Republicans are struggling for control of Congress, there's another important battle brewing over state legislatures. Edwin Bender, executive director of the National Institute of Money in Politics, joined Kimberly Adams to discuss why there's so much money and attention spent on these state races. The following is an edited transcript of their conversation. (Markets Edition) British Prime Minister Theresa May is doubling down on Brexit, saying that any compromises or ideas of a new referendum on the UK’s planned exit from the EU wouldn’t be in her nation’s best interests. Also, the S&P 500 will be reclassifying Facebook and Alphabet, which is the parent company of Google. They’ll be shifting from the tech section of the index, which affects investors. A major labor union, the United Farm Workers, recently elected its first female president. Teresa Romero will be the first Latina and immigrant woman to lead the national union since union organizer Cesar Chavez helped found the UFW back in the 1960s. The UFW has been involved in creating better working conditions for farm laborers since its inception. But with a number of issues such as immigration reform, low union membership and automation affecting the labor industry, how will Romero and the UFW lead its members and other agriculture workers in the near future? Now that classes start mid-August for many schools in the United States, Labor Day weekend is less of a "Goodbye, sweet summer!" thing. Even the AAA has stopped predicting a traveler’s forecast. (U.S. Edition) Monday might have been the Labor Day holiday for Americans, but it's business as usual in China. The Chinese president will be meeting with African leaders at a summit in Beijing while also encouraging Chinese businesses to invest no less than $10 billon on Africa in the next three years. Also, the United Farm Workers elected Teresa Romero as its first female president, and she's also the first immigrant woman to lead a national union. Then, we move to the perceived end of summer. It used to be Labor Day, but earlier starts for schools changed that. (Global Edition) From the BBC World Service … To stem its ongoing currency crisis, Argentina is set to unveil a new round of spending cuts as its finance minister heads to Washington to try and secure a deal for quicker IMF payments. Investors are closely watching any new developments, but what does it all mean for local businesspeople trying to make a living? Labor Day is the perfect day for the last installment of our summer entertainment series. The movie "Demolition Man" is set in 2032. It portrays a utopian society with no crime or bad thoughts. Sandra Bullock plays a rookie future cop. Wesley Snipes is a supervillain on the loose. And Sylvester Stallone is the old-school violent cop brought out of cryostasis to hunt him down. Its 1993 tech predictions were solid. It had self-driving cars, video conferencing, voice-activated technology and even touch-screen tablets. Labor Day is the perfect day for the last installment of our summer entertainment series. The movie "Demolition Man" is set in 2032. It portrays a utopian society with no crime or bad thoughts. Sandra Bullock plays a rookie future cop. Wesley Snipes is a supervillain on the loose. And Sylvester Stallone is the old-school violent cop thawed out of cryostasis to hunt him down. Its 1993 tech predictions were solid. The movie included self-driving cars, video conferencing, voice-activated technology and even touch-screen tablets. The life of the Queen of Soul, Aretha Franklin, was celebrated in her adopted hometown of Detroit on Friday, as an all-star lineup of mourners and performers gathered at the Greater Grace Temple to pay their respects. Franklin was born on March 25, 1942, in Memphis, Tennessee, and enjoyed a singing career that spanned more than six decades. She died Aug. 16 at the age of 76. Coca-Cola is the latest corporation to make a big bet on coffee. It's planning to buy the United Kingdom's biggest coffee chain, Costa, for $5.1 billion. It seems as if everyone wants a piece of the coffee action these days. European conglomerate JAB has picked up Peet's, Caribou and Stumptown. Nestle owns the high-end Blue Bottle chain and it recently closed a marketing deal with Starbucks. That's what data obtained by the Wall Street Journal's senior sports reporter Rachel Bachman shows. According to numbers of ticket scans from the 2017 season, only 71 percent of the people reported in official attendance numbers actually showed up to the stadium. So why inflate the numbers? And what's keeping fans watching from home? "KEEP CALM AND CARRY ON!" That was the message on a morale-boosting poster produced by the British government before the outbreak of the Second World War in 1939. The same message – more or less – is being sent out by the current British government as Britain faces what has been described as its biggest peacetime challenge since the defeat of Hitler: Brexit. Comparing Britain’s departure from the European Union with a world war may seem laughable. Earlier this week, the United States and Mexico reached a trade agreement as apart of the North American Free Trade Agreement overhaul. Then it was Canada's turn. But after three days of talks, the United States and Canada have no deal. Will Canada walk away? We'll get into it with the Weekly Wrap. Speaking of negotiations, the British government has yet to strike a Brexit deal with the European Union, its largest trading partner. In a busy neighborhood in Istanbul, 27-year-old Majd wanders among the Syrian-owned shawarma shops and crowded cafes, with a leather portfolio tucked under his right arm. It’s been just one week since he fled Damascus, Syria, for Turkey, to avoid being drafted into the military. His portfolio holds what he believes will be his ticket to a strong future: a bachelor’s degree in economics from Damascus University. He always carries it with him, he says in Arabic. China’s government has long restricted the number of children a married couple can have, but change could be on the way. All references to family planning have been removed from a widespread civil code that moderates everything from contracts to marriages. Some Chinese media said this is the clearest sign yet that the government will let families have as many kids as they want. David Brancaccio spoke to Marketplace's correspondent in China, Jennifer Pak, about this. Below is an edited transcript of their conversation. China appears to be moving on from "family planning"
(Markets Edition) President Trump is making a Friday trip to Charlotte, N.C. to sign an order designed to help set up retirement plans for small businesses. Then, we look at how the borrowing binge from the U.S. federal government is actually affecting other countries already dealing with a variety of other money challenges. Also, in China, a draft of a civil code is missing a very key piece: any reference to family planning. (U.S. Edition) The U.S. and European Union seem to have reignited their feud over trade. The EU offered to drop European car tariffs if the U.S. followed suit, but President Trump declined to do so in an interview. Where does this leave the two sides? Also, Wells Fargo is making bad news again. This time, the bank suspended or fired more than a dozen employees over forged meal receipts. (Global Edition) From the BBC World Service … Got your morning coffee? Now, so does Coca-Cola – it’s buying coffee chain Costa for just more than $5 billion. Then, the Argentine peso has seen a sharp drop against the U.S. dollar so far this year as it suffers from another financial crisis. We’ll explore what’s happening and how the president is trying to fix it. Afterwards, a checkbook-printing company was in the news this week because of a labor strike … which got us thinking: How many people still use checks anyway? Back in June, California passed the strictest online privacy law in the country, set to go into effect in 2020. The law would, among other things, require companies to be more transparent about what data they collect and why, tell people whom they're sharing it with and let consumers delete personal information. The United States has no federal online privacy laws. But some tech companies are so worried about the effects of California's law that they're now asking for nationwide rules. This fall marks 35 years since Air Illinois Flight 710 crashed. The commuter service flew to many smaller airports and provided a quick way for travelers to venture across the state. That is until October 11, 1983. 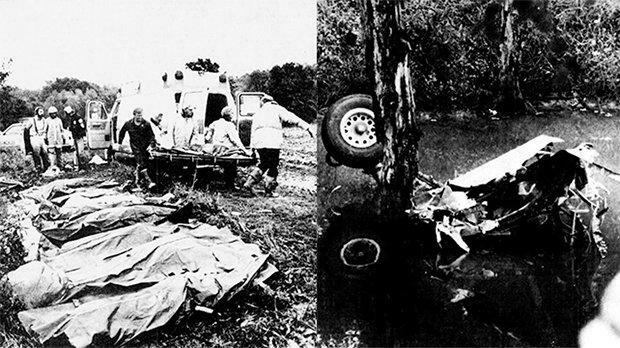 The plane took off from Springfield, quickly ran into trouble and a half hour later went down in a southern Illinois farm field near Pinckneyville, killing all 10 aboard. Wells Fargo is back in the news, again. And, again, it's for the wrong reasons. The company announced on Thursday it has fired or suspended more than a dozen employees for allegedly forging meal receipts on expense reports. The news comes as Wells Fargo tries to turn itself around after two years of scandals. Is the Fed causing turmoil in emerging markets? It's been a bad week for emerging market economies. The Turkish lira continues to lose ground against the dollar while the Argentine peso fares even worse, so much so that Argentina's central bank raised its interest rates to 60 percent. Yes, six-zero. Domestic problems in the two countries have not been helped by the United States. Higher interest rates set by the Federal Reserve make it harder for emerging market economies to hold on to foreign investment and repay their dollar-denominated debts. Microsoft will require vendors to offer their employees the same parental leave Microsoft offers its own employees. That will cost the company more, but it hopes to score better hires and cultivate worker loyalty in return. There's a group of three by three blocks in Manhattan containing 70 businesses that sell alcohol, most of them with a full liquor license. We talked with the locals, who call it "Hell Square." But first: After finding refuge in Turkey, many young Syrians had to put their education and career plans on hold. Now some are discovering new passions, while others are just dealing with a new economic reality. Plus, the latest on inflation numbers and an exit interview with American Enterprise Institute President Arthur Brooks.